~to speak on several other topics I'm passionate about such as organic gardening and the quality of our food. ~to bring you news relating to worm composting here and around the world. ~and invite you to share your worm composting experiences. Continue reading "Worm compost bin"
Would you like to share your knowledge about worm compost? Great, find out how you can submit your story or tip here. Continue reading "Contribute to Worm Compost"
Continue reading "Worm Compost Puts Life Back in Your Soil and Health in Your Plants"
Continue reading "Is it necessary to dry out the worm compost? " Continue reading "worm bedding or food"
Continue reading "Storing worm castings"
Our worm compost events calendar shows our scheduled appearance at farmers markets and other venues. .
Continue reading "Worm Compost Events Calendar"
Continue reading "How Much Water to Add to Bin "
Continue reading "Weeds for bedding"
“Healthy soils = healthy food = healthy people,” is a fundamental tenet of many ecological farming systems, yet the nutritional quality of food grown by organic and conventional methods is the subject of much controversy. The mainstream scientific community argues that nutritional differences do not exist and that plants don’t know the difference between organic and chemical fertilizers. Organic advocates claim organically grown foods are nutritionally superior because such foods contain higher levels of vitamins, minerals and amino acids, and have a much greater level of vitality and are more disease and pest-resistant. In addition, the plants are more healthful due to lower levels of pesticide residue and nitrate-nitrogen and have greater density and better flavor. Continue reading "Using worm tea on Orchids"
Continue reading "COW & HORSE MANURE"
Continue reading "Worm Bin Heating Up"
A grassroots coalition of health, environmental and consumer organizations filed papers last fall with the California Attorney General's office to place a citizen's initiative on the ballot late in 2012. If the measure is successful, California would be the first state to adopt mandatory GMO labeling laws. Continue reading "Help support the GMO labeling campaign in California"
Farmers get clever, use Kickstarter to promote Aquaponics in North Carolina. Forget venture capitalists or bankers. Kickstart is the new way of raising working capital for small businesses. Fantastic idea! Continue reading "Farmers get clever, use Kickstarter to promote Aquaponics in North Carolina." A town growing all its own veggies? This one in England is doing just that. Hopefully, the idea will spread to the U.S.
Continue reading "The deliciously eccentric story of the town growing ALL its own veg(etables)"
(NaturalNews) A Denver, Co., public school has set the bar high for reconnecting the next generation of children with the food they eat. ABC 7 News in Denver reports that Denver Green School (DGS), an urban "innovation" school, has brought new life to an unused, one-acre athletic field by turning it into an organic garden -- and the garden has been such a success in just eight months that the school is able to serve fresh produce from it to students in the cafeteria. Continue reading "School turns abandoned athletic field into organic garden"
The times and towns, they are a-changing. And by the sound of this article, San Fran is getting downright earthy. Though this article is a year old, it's still current as far as people learning and asserting self-reliant skills. Continue reading "That Big Farm Called San Francisco"
A 1976 article that has even more relevance today. "The garden is the best place to start looking for ways to help people become more independent. A garden is both the symbol and reality of self-sufficiency—especially an organic garden, which recycles organic wastes of the yard and household, permits the production of significant amounts of food with only minimal reliance on outside resources. Any campaign to boost personal independence should start by helping people become gardeners—teaching, motivating, and making land available." Continue reading "How Independent Are You?" The tired refrain of federal, state or local government that they must intervene because "someone might get sick" is getting pretty stale. Since when is it any level of government mandate to save us from ourselves? Especially when it pertains to food? While shares in fruit and vegetable farms have been a popular part of the local food movement, a new trend is buying shares of animals. But this new trend disturbs authorities, so much so that prosecutors have sent cease-and-desist letters to small herd share cooperatives across the state - including Evergreen Acres in Santa Clara County - and even staged an armed raid on a Ventura operation. In this climate, local herd share operators, many of whom prefer anonymity, are coming out of the shadows next week. They are planning a downtown Santa Cruz "milk-in" to raise awareness about what they say is a misuse of taxpayer funds and government resources. Now They're Sanitizing Almonds! What's next? If all almonds now require pasteurization, what foods will be next on the list of mandatory sterilization, heat treatment, or irradiation? This may be the first step toward a sterile food environment that protects processors from lawsuits and facilitates industrial-scale food processing and distribution—which is exactly the kind of environment that fosters bacterial contamination. Continue reading "Now They're Sanitizing Almonds! What's next?" 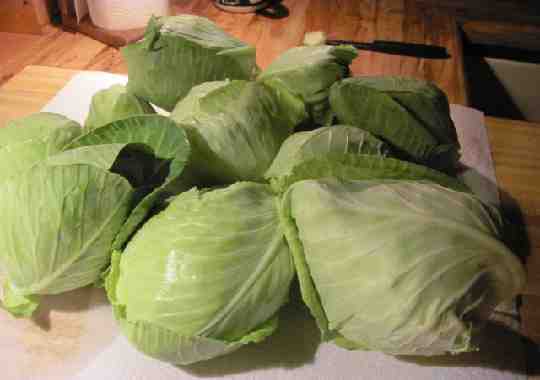 I've been harvesting my Early Jersey Wakefield cabbage(Heirloom from Burpee)on and off for several weeks now. 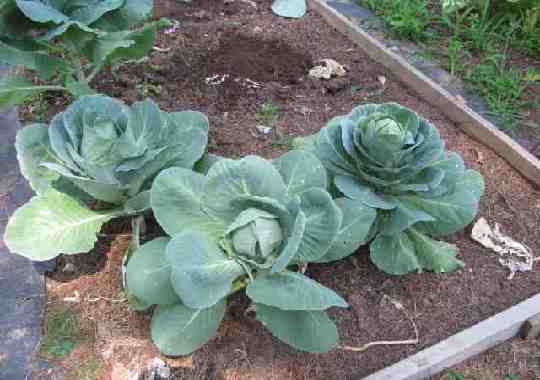 I have planted a variety of veggies, but somehow cabbage never made it on the list, usually it was just too late. It was unseasonally cold the first part of May when I set them out knowing that it could be too late in the season to get a nicely developed head. By mid-June it was starting to finally warm up. Since I seeded them in straight compost with an additional handful in the transplant hole, the plants were beautiful and big. 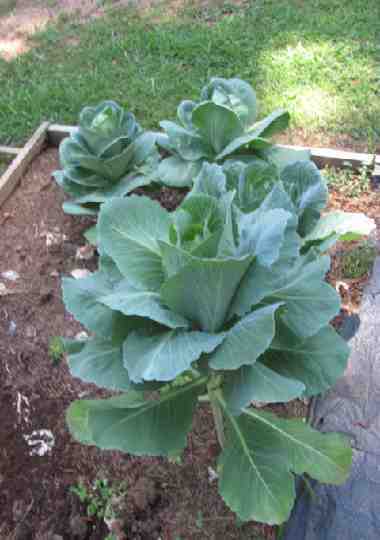 But, by mid-July it was getting hot and I didn't know if I would get any cabbage at all. So I just waited and watched and slowly they started forming their heads. I've picked close to 15 heads from 1/2 - 1 pound each. And they were not bitter as a couple of smaller heads were used for slaw. Delicious. I pulled out my old (1973)Stocking Up book from Organic Gardening to see how sauerkraut is made. Will know in a week. In Late May, the DOT (Dept of Transportation) proposed a rule change for farm equipment, and if it is allowed to take effect, it will place significant regulatory pressure on small farms and family farms all across America – costing them thousands of dollars and possibly forcing many of them out of business. The Federal Motor Carrier Safety Administration (FMCSA), part of the Department of Transportation (DOT), wants new standards that would require all farmers and everyone on the farm to obtain a CDL (Commercial Drivers License) in order to operate any farming equipment. The agency is going to accomplish this by reclassifying all farm vehicles and implements as Commercial Motor Vehicles (CMVs). In April I posted my ambitious project of transplanting an old,thornless, blackberry bed and planting strawberry plants in the cinder block retaining walls. Well, the blackberries are loaded and look great. The strawberries didn't get enough water early on and didn't produce the quantity I was hoping for. The water problem was fixed and the plants themselves are beauties. They may yet produce a fall crop. Though I live on the opposite coast from this organic farmer, I'm incensed at what his local government is doing to drive this good man from his farm. If you live in the Potomac, MD area, please read this and stand up against this land grab. Nick's Organic Farm is a heritage farm, one of the few organic farms in our county and the only one to produce genuine organic seed. And now the Montgomery County government wants to destroy it. Earlier this year, the Montgomery County School Board, which owns the land, gave Nick three weeks notice that they intended to cancel his lease, and give the lease to the county government in order to build... soccer fields. The deal was made with no public or community input. Although the article does not mention it, this is where customized, fungal-dominated worm tea could make an important contribution. The next agricultural revolution may be sparked by fungi, helping to greatly increase food-production for the growing needs of the planet without the need for massive amounts of fertilizers according to research presented today at the 111th General Meeting of the American Society for Microbiology in New Orleans. While mycorrhizal fungi typically only grow on the roots of plants, recent biotechnological breakthroughs now allow scientists to produce massive quantities of the fungus that can be suspended in high concentrations in a gel for easy transportation. Sanders and his colleagues are currently testing the effectiveness of this gel on crops in the country of Colombia where they have discovered that with the gel they can produce the same yield of potato crop with less than half the amount of phosphate fertilizers. Continue reading "Fungi reduce need for fertilizer in agriculture"
Here, local food isn’t just hip, it’s a unifying factor not only among African-Americans and whites but between them. Food is an issue on which it seems everyone can agree, and this is a lesson for all of us. Continue reading "Detroit's Revitalization Through Community Gardens"
We all know that most garden crops want as much sun as possible. Tomatoes, melons and peppers will positively pout if they don't get oodles of light. What you may not realize is that many other garden crops will do quite well with limited sunlight. Continue reading "40 Fruits, vegetables and herbs that will grow in partial shade"